One of Pfizer’s biggest selling meds, Xanax is usually prescribed for those who suffer from anxiety and depression, but it seems the drug causes the very thing it is supposed to treat – if you count losing your mind and shooting dozens of people a bit ‘anxious’. The crazy “shooter” at the University of California, Santa Barbara, who shot six students in a rampage was likely addicted to benzodiazepines, a class of pharmaceuticals that can lead to extreme hysteria and outbursts of violence. 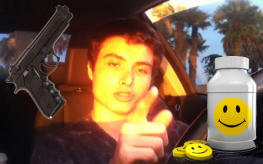 Elliot Roger, the 22-year-old man blamed for a shooting spree in Isla Vista, California, was on Xanax. But he certainly didn’t start this trend. Aaron Ybarra, a 26-year-old who opened fire with a shotgun at Seattle Pacific University, killing one student and wounding two others had been prescribed the antidepressant Prozac and antipsychotic Risperda. 16-year-old Chris Plaskon stabbed Maren Sanchez, also 16, to death in a stairwell at Jonathan Law High School after she turned down his prom invitation, but he was taking drugs for ADHD. James Holmes was hooked on a cocktail of Big Pharma drugs that have been found to be deadlier than cocaine and heroin combined (even at ‘safe’ levels). But the trend continues much farther. Columbine shooters Eric Harris and Dylan Klebold, as well as 15-year-old Kip Kinkel, were all on psychotropic drugs. Even Ted Kaczinski the “Unabomber”, Michael McDermott, John Hinckley, Jr., Byran Uyesugi, Mark David Chapman and Charles Carl Roberts IV, the Amish school killer,were all on some form of SSRI psychotropic pharmaceutical drugs. Drugs like Xanax, Ambian and Prozac are causing people to act in violent ways, yet the root cause is ignored. The strange similarity in all these cases, too, is that these are young individuals. They have been abused by the medical field, and even if they have been ‘treated’ for mental health issues, they are being poisoned with meds that cause disastrous results to the pubic at large. The fact is that psychiatric drugs are alarmingly dangerous. This is a $330 billion industry, which is not kept accountable for the damage it causes to individuals and society. According to the US Department of Veteran’s Affairs, 23 Soldiers and Vets commit suicide every day despite taking antidepressant drugs, more than 17 million children are taking some sort of Big Med poison – 10 million of them in the United States. No wonder we are a world gone crazy – we’re being polluted by drugs that make us go insane. We keep hearing the same line from Big Pharma – that they are here to make us feel better. The truth is that these companies care very little about our health if it means profit-loss. And, another article found that over 10,000 2-year olds in the U.S. are already on these drugs! Instead, it’s more fun to target the NRA and the 2nd Amendment versus Big Pharma.